Notorious PhD hosted a forum over at her blog to encourage discussion about the relationship between grad students and professors. She summed up the results of the debate, and much of it involved better communications on the part of professors. More professors need to get the memo that there are fewer academic jobs, but students can definitely use their knowledge in other ways, provided they are trained for it. The catch is that most professors haven’t been trained to be career advisors. So, does anyone have suggestions for how professors can get more involved in helping students with non-academic careers? Perhaps nurturing relationships with other departments, such as education or computer science? More after the jump! 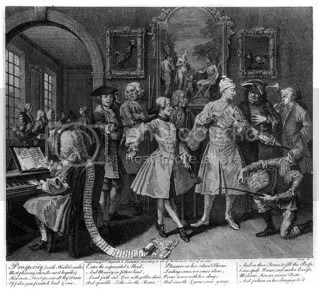 William Hogarth: A Rake’s Progress, Plate 2: Surrounded By Artists And Professors, public domain, Wikimedia Commons. Why are certificates in education studies not more widely promoted as a tool of professionalization and a marker of preparedness? We are offered certificates in women’s studies, English as a Second Language teaching, and a host of other programs, so that would seem to be a relatively easy way to credential our graduates for careers outside academe. That’s a great question, but it will take a lot of work to establish such connections. Rivalries often develop between departments, so professors and administrators will need to reach out to each other to get a certificate system set up. Any other ideas for helping grad students find non-academic jobs?